Born in St. Kitts and brought up in the UK, bestselling author Caryl Phillips has written about and explored the experience of migration for more than thirty years through his spellbinding and award-winning novels, plays, and essays. Now, in a magnificent and beautifully written new book, Phillips reflects on the shifting notions of race, culture, and belonging before and after the September 11 attacks on the World Trade Center. Color Me English opens with an inspired story from his boyhood, a poignant account of a shared sense of isolation he felt with the first Muslim boy who joined his school. Phillips then turns to his years living and teaching in the United States, including a moving account of the day the twin towers fell. We follow him across Europe and through Africa while he grapples with making sense of colonial histories and contemporary migrations--engaging with legendary African, African American, and international writers from James Baldwin and Richard Wright to Chinua Achebe and Ha Jin who have aspired to see themselves and their own societies more clearly. A truly transnational reflection on race and culture in a post-9/11 world, Color Me English is a stunning collection of writing that is at once timeless and urgent. Caryl Phillips is the author of numerous works of fiction and nonfiction. His novel A Distant Shore won the Commonwealth Writers' Prize, and his other awards include the Martin Luther King Memorial Prize, a Guggenheim Fellowship, and the James Tait Black Memorial Prize. He is a Fellow of the Royal Society of Literature and lives in New York. "[A] polymorphous delight that always retains at its core the notion of identity: how it is constructed, how it is thrust upon us, how we can change it....Though Phillips writes specifically here about racism and the experiences of immigrants, his cogent argument is equally applicable to the climate in which we find ourselves." With the elegance and maturity of a prize-winning author . . . Phillips lives, breathes, and masterfully teases into prose the singular dilemma of the outsider. 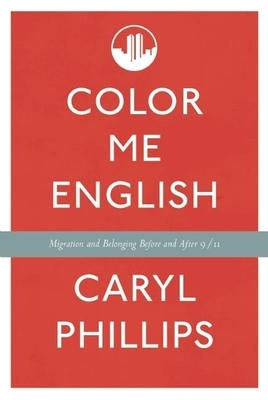 [Phillips is] an insightful and sympathetic chronicler of race, British identity, and the immigrant experience. [Phillips] writes wonderfully crafted, deeply meditative treatises on the black experience in a global and historical sense . . . . [He is] intellectual and reflective but always interesting and informative. In these nearly 40 essays on migration, literature, and politics, novelist Phillips (A Distant Shore) revisits his youth in Leeds, recalls visits with other writers (e.g., Chinua Achebe, James Baldwin), recollects travels in disparate lands (Israel, France, Sierra Leone, Belgium), and meditates on the perspectives of the displacedexiles, refugees, immigrants. He reassesses writers as diverse as Lafcadio Hearn, Claude McKay, and Shusaku Endo, along with a number of British writers. While most essays are compelling, two groupings stand out: "Beginners" for what it shares about Phillips's writing process, and "Homeland Security," the book's most memorable section, which moves from a personal and very moving account of September 11 to a blistering account of the "discriminatory legislation enacted in [its] wake" and the "changes in the national mood" that threaten American pluralism. All of the essays, regardless of topic, reflect upon Phillips's "triple heritage""British, African diasporan, Caribbean"and brim with curiosity and cosmopolitanism.